Thika is a relatively new diocese which was created in 1998 and is about 30 miles north of Nairobi. Ruiru is an archdeaconry within the diocese lying on the Thika and Nairobi boundary. It is semi-urban with a fast growing population and is fast becoming a commuter belt for people working in Nairobi and Thika. In 2007 we were fortunate to have a visit from Rev. Wilson Mwangi and his wife Jennifer who had been ministering in Ruiru. They took part in worship at both St Michael’s and St Barnabas and Wilson gave his testimony and spoke about the growth in the Church in Ruiru and ways that help to bring about similar growth here. They also gave us an insight into the vibrancy of worship in Kenya and taught us a song that needed to be sung with great enthusiasm and energy! January 2008 heralded a very bad time for Kenyans with the wave of violence and destruction that resulted from the General Election there. We were kept informed by the then Diocesan link co-ordinator, Rashell Beya by email. This was good as through her we heard from the Bishop and others living in the area and it helped us to focus our prayer support. Nevertheless it was a relief to hear from Kellen Kinya in May 2008 that life was returning to normal again. 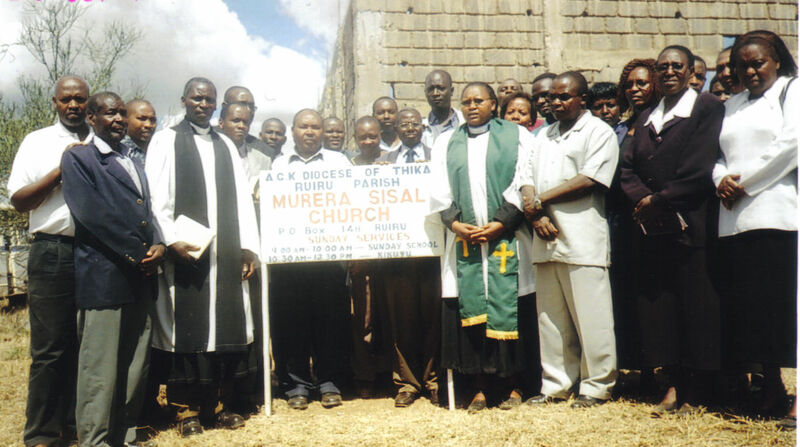 In February 2009 we heard from Ruiru that they, like us were celebrating a Diocesan anniversary this year their 10th and our 1100th! Their celebrations included a 25km walk from St Michael’s Church to St Andrew’s Cathedral in Thika and they were interested to hear about our own celebrations in June. Here are some photos of that visit – as you can see, we had a lot of fun! Peter is diocesan bishop of Paraguay, pastor of the pastors, ordaining ministers and opening new paths for the kingdom to advance. Sally serves the church through teaching and discipling, encouraging others to enter God’s kingdom and develop their leadership skills. We became disciples of Jesus Christ as teenagers. A university prank brought Sally and I together. We soon fell in love and got married. Peter worked as a senior social worker with children at risk, and was a leader in our local church in Doncaster. Sally was a science and maths teacher, and also involved in women’s ministry. We both sensed God’s calling to those who had not heard the good news of the kingdom and with our children, David and Karen, ministered in the Anglican Church in Bolivia for 13 years. Peter was ordained as deacon and priest there. After going back to the UK and serving in a parish in St Helens, out of the blue on the runway of Osaka airport, we sensed a call to live in an unknown place – the beautiful city of Asuncion, Paraguay. Here we love to see others find salvation and freedom through Jesus Christ, and to see believers sharing their faith and growing as leaders. We joined Church Mission Society because it was important for us to be part of a larger mission movement, sharing Jesus across the world. Being part of CMS helps us mobilise support and prayer for ministry, be accountable, and be encouraged to do the things which God the Father has in his heart prepared for us to do.